I am very pleased to have been formally commissioned by the Ihsan Mosque of Norwich to handle all school visits from December 1, 2014. NEW: Full primary programme now available. – Mr Jamal Sealey, Muslim community leader. See full pdf text for details from the original February roll-out. For Enquiry & Immersion, students will be presented with an enquiry exercise expanding their understanding of Islam, and will then have the opportunity to informally engage with Muslim community members over lunch, see the prayer, and tour the mosque grounds. For my own professional development, there is an added bonus; creating a Primary course by changing only materials, rather than the lesson plan as such, will vindicate my claims about the transferable nature of Cooperative Learning lessons. (IoE teachers especially, follow this on twitter). – Ian Burns, RE coordinator, Acle Academy, after first trail of Enquiry & Immersion, 13 November 2014. 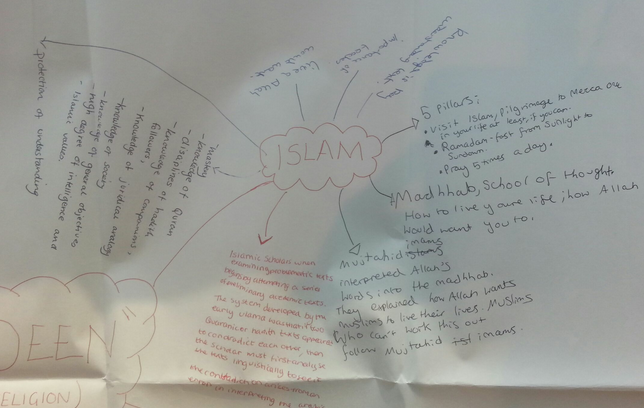 10 – 12 Enquiry exercise into Islam at Norwich Wellbeing Centre hosted by Jakob Werdelin. 12 – 13 Lunch, on floor, gender segregated, informally hosted by members of mosque community. Price includes lunch for each student & teacher, provided by Jamoroc Catering. 13 – 14+ Mosque Tour, including community history and Q&A. Booking is now open for 2015. Interested schools should contact me by mailing ihsan.mosque.school.visits@werdelin.co.uk. More about CL on the other site, and about the Ihsan Mosque on muslimsofnorwich.org.uk. Useful links: muslimsofnorwich.org.uk, norwichwellbeing.com, werdelin.co.uk.